The small Pirahã tribe will be affected by the Madeira river dams in the Western Amazon, Brazil. These mega dams threaten to harm or destroy large areas of land which are home to numerous tribal peoples. Two mega-dams being constructed in the Brazilian Amazon threaten to devastate several groups of uncontacted Indians. The Santo Antônio and Jirau dams are being built on the Madeira River, next to the territory of isolated Indians who are unaware that much of their land is likely to be destroyed. A recent expedition carried out by FUNAI, the Brazilian government’s indigenous affairs department, confirmed that there are uncontacted Indians living and hunting in the area affected by the dams. There are at least four groups of isolated Indians in the area of the dams project, two of them known as the Mujica Nava and the uncontacted Jacareuba/ Katawixi Indians. The dam project will create new roads and bring a massive influx of migrants into the area – this will rapidly destroy the Indians’ forest. The migrants will also bring diseases such as flu and measles to which the Indians have little immunity. Any form of contact between isolated tribes and outsiders is extremely dangerous to the health of the Indians and could lead to the death of many, as has frequently happened in the past. FUNAI’s report states that the noise of the dam construction has probably already pushed some of the uncontacted Indians off their land, into a territory where miners are operating illegally and where malaria and hepatitis are rife. As well as threatening the uncontacted Indians, the dams will harm many other indigenous peoples living in the area. They were not appropriately consulted about the dams before building work started. Domingos Parintintin of the Parintintin tribe said, ‘Our land is still virgin. We hope that this project will not continue, because it is our children who will suffer. There will not be enough fish, or enough animals for us to hunt’. The French company GDF Suez, which is part-owned by the French government, is building the Jirau dam. A coalition of NGOs including Survival, Kaninde, Amigos da Terra- Amazônia Brasileira, International Rivers, and Amazon Watch has protested to the Brazilian authorities and GDF Suez and called for the dams to be halted. Recently a GDF Suez shareholder questioned the company’s President, Gérard Mestrallet, about the uncontacted Indians near the Jirau dam, at the company’s AGM. Mestrallet stated that President Lula supports the dam, and that, ‘if anyone knows what is good for the Brazilian population and at the same time (can) reflect on the preservation of the local Indians, then it is certainly President Lula’. Kayapó indigenous spokesman, Megaron Txucarramãe, recently stated that, ‘Lula has shown himself to be the Indians’ number one enemy’ after the President said that the controversial Belo Monte dam on the Xingu river would go ahead despite huge opposition. Stephen Corry, Survival’s director, said today, ‘The construction of the Santo Antônio and Jirau dams must be suspended. If this does not happen, many Indians will see their lands invaded and natural resources plundered. 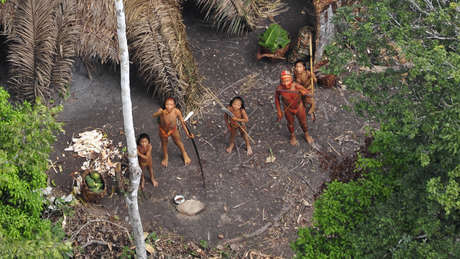 Uncontacted groups could be decimated or even wiped out. The Brazilian government will be held responsible for such a disaster’.